The ever-increasing integration of decentralized and intermittent renewable generation sources induces new challenges to normal operation of distribution networks, pertaining the reliability and quality of power supply. The newly emerging broad range of distributed energy resources (DER), including local storage systems, electrical vehicles and demand response, pose radical changes in the planning and operation of power systems. Power systems were designed to accept solely bulk power from transmission system and distribute to customer. Therefore the noticeable integration of DERs results in bidirectional power flows, with the possibility of occurring constraints such as branch congestion and voltage unbalances among downstream feeders. Since the traditional Distribution Networks were purely passive, the increasing share of DERs triggers a transitory regime to a more active network. The so-called Active Distribution Networks (ADN) refer to the direction of making use of the flexibility services offered by DERs for Active Network Management (ANM) in addition to distribution automation. Complementary, there is a significant effort to render the facilitation of advanced functionalities on the Secondary substation enhancing Distribution Automation. The latter is substantially leveraged by the deployment of Advanced Metering Infrastructures (AMI), Intelligent Electronic Devices (IED) as well as advanced Information and Communication Infrastructures (ICT). In terms of Medium Voltage DN the ANM implementation is attained through the combination of passive infrastructures with active resources (i.e. 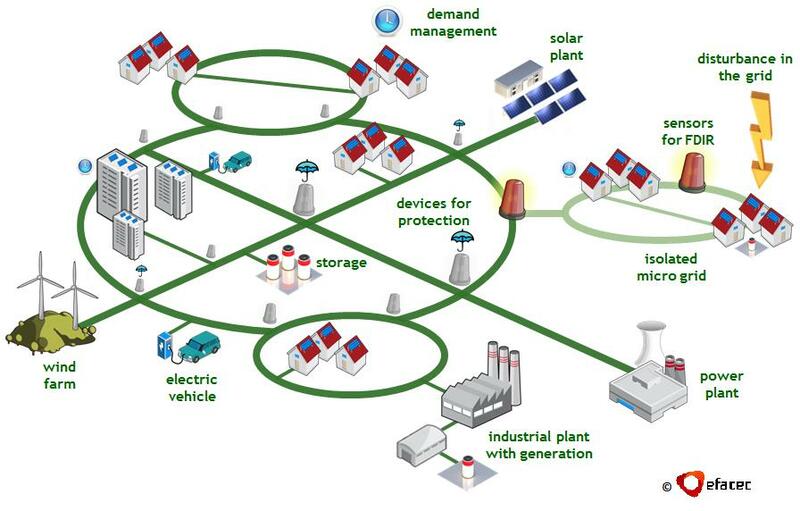 Storage, STATCOMs, SVRs, DERs, microgrids etc.) and advanced ICT infrastructures. This evolution imparts higher complexity in the management of distribution systems, whilst enabling the smart grid paradigm as a key driver to a shared new vision devoted to giving more flexibility to distribution network using advanced concepts and methods. The basic perspectives of Active Distribution Network (ADN) are to reinforce the reliability, security of supply and power quality as well as to increase the hosting capacity for Renewable Energy Sources (RES) in the existing distribution network. The lynch pin that ADN leans on is the establishment of a harmonic synergy between the distribution automation and flexibility services of DERs. This will lead to efficiently exploit the existing power system infrastructure by taking full advantage of DERs control (through dispatching set points), responsive loads, control of OLTCs (On Load Tap Changer), reactive power management as well as system reconfiguration. Within these evolving scenarios, an additional factor that fosters the transition to ADN is the advent of distribution automation on the Low Voltage (LV) network. The monitoring of distribution networks is extended among the secondary substation and LV feeders, contributing in the frame of enhancing network observability. Amid to these innovative and radical changes regarding the network operation, the ANM will enable features and functionalities of asset management, disturbance management and congestion management. The DERs possess an instrumental importance on the Active Distribution Management since they persevere to endeavor an active participation on network operation rather than being a bottle neck from technical and economic point of view.